A Bonus Issue, which is sometimes referred to as "Scrip Issue" or "Capitalisation Issue", is effectively a free issue of shares - paid for by the company issuing the shares out of capital reserves. (Please note that a Scrip Issue should not be confused with a Scrip Dividend). The general purpose of a Bonus Issue is to increase the liquidity of the company's shares in the market - by increasing the number of shares in circulation, which has the effect of reducing the share price. The term 'Bonus Issue' is generally used to describe what is technically a capitalisation of reserves. The company, in effect, issues free shares paid for out of its accumulated profits (reserves). The issued share capital increases by 25%, although this is offset by the reduction in the capital reserves. In this example, you receive 1 new Bonus Issue share for every 4 shares held. If you own 1000 shares, (1000/4 = 250) then you will receive 250 new bonus shares. When you make a full or part disposal of your ABC plc shares, it is the new reduced base cost that you use in your Capital Gain calculations. To enter a share reorganisation, follow the general instructions defined on the Share Reorganisation page. This section discusses how to enter specific details relating to Scrip, Bonus & Capitalisation Issues. For simplification a Scrip, Bonus or Capitalisation Issue is collectively referred to as a Bonus Issue when using timetotrade. When managing Bonus Issues you are typically told the ratio of old to new shares and you will know the number of new shares you receive as a result of a Bonus Issue. 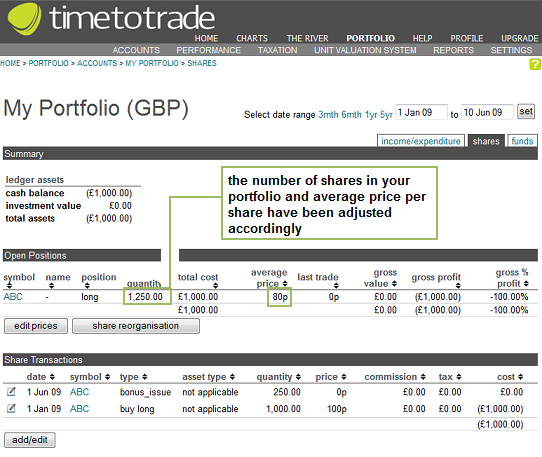 Firstly, make sure the original share purchase is listed in your timetotrade share portfolio. 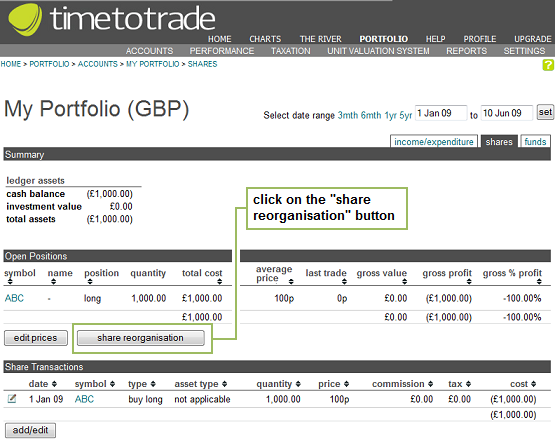 As you can see in the screen shot below, in this example we purchased 1000 shares in ABC plc on 1 Jan uary 2009. For the purposes of illustration only, we will assume that no commission or stamp duty was paid. To add the bonus issue shares, click on the "share reorganisation" button as illustrated above. This will take you through to the Share Reorganisation page. Firstly select the date that the new Bonus shares were issued. In this example, I will say that the bonus ABC plc shares were issued on 1st June 2009. Select the date from the calendar or type "1 Jun 2009" into the date field. When finished, click the "submit" button. Next you need to identify which of the share holdings in your portfolio is subject to the share reorganisation. 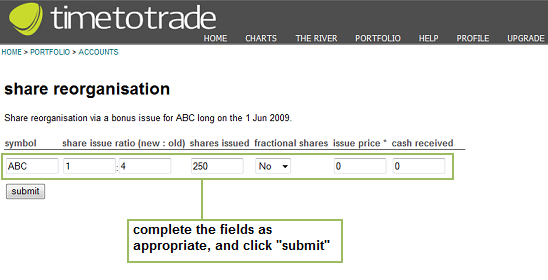 In this example, we would select "ABC" share holding from the drop down menu. Once you have selected, click the "submit button". Now we need to select the type of share reorganisation. In this instance select "Bonus Issue" from the drop down menu. (You would select "Bonus Issue" for "Capitalisation Issues" and "Scrip Issues" too). Once you have selected "Bonus Issue", click on the "submit" button. We're now nearly done. Next stage, we need to complete the fields shown below. Symbol = ABC (in this instance the bonus shares issued were of the same type, class and use the same symbol/epic code as the existing holding. If you were issued with a different class of share or shares in a different company, you would input the epic code for new shares here instead). Fractional Shares = it is very rare in the UK for fractional shares to be issued, so the system defaults to "no". If you do receive fractional shares then you would change this to "yes". Cash Received = if you receive any cash as a consequence of the bonus issue, input the amount here. Any cash received will be deducted from the base cost in calculating your future capital gains on disposal. Once finished, click on the "submit" button. You will now see a summary of the details input. Check the details are correct, and click on the blue "click here to return to ledgers" to take you back to your share portfolio page. Returning to your share portfolio page, you can see the bonus issue transation has been added and that your "open positions" show you now own 1250 shares of ABC plc, with average purchase price of 80p per share, as expected. The bonus issue has now been correctly accounted for within your timetotrade accounts.